We're up bright and early to try to make as much of the short daylight hours as possible. Except that's it's not so bright this morning. A bit overcast and very chilly! 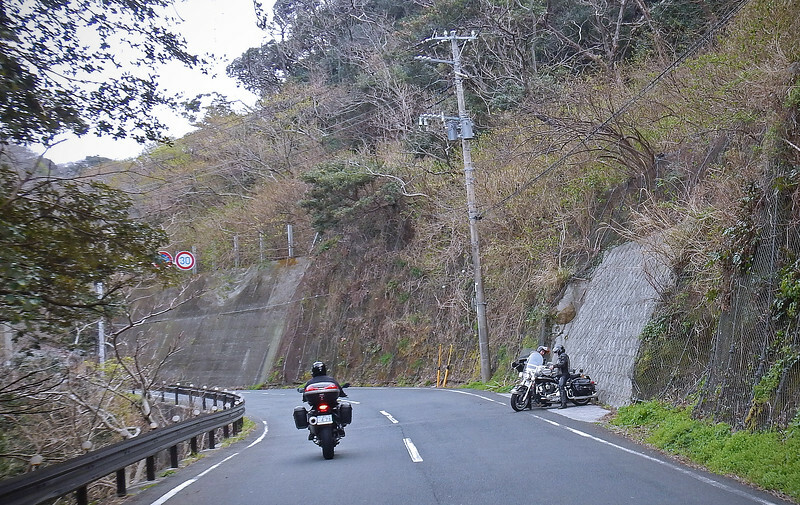 Other than the bikers at Izu Skyline, we haven't seen a lot of other motorcycles on the road. Still too early in the season, I guess. We hop back on the Skyline where it turns into a non-toll road and continue south into the interior of the peninsula. Our bikes take in more twisties in the mountains, but it's nowhere as scenic as the coastline views of the Skyline. Until we see this fantastical structure in front of us! 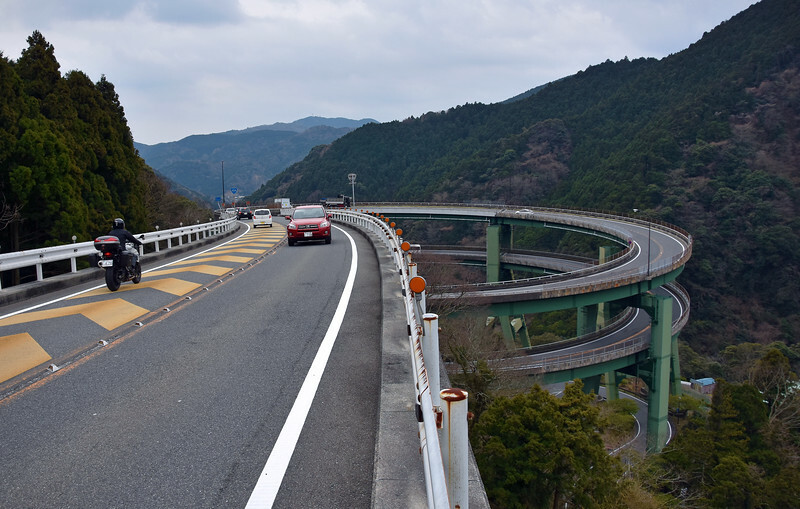 The Kawazu-Nanadaru Loop Bridge! The high elevation road we're on needs to connect to a smaller one 45 meters below us. The problem is that we're in a narrow valley between two steep mountains and there's only about 80 meters of space to achieve that vertical drop. A ramp of those dimensions would give you a 56% grade, which is venturing into elevator-shaft territory. So the Japanese engineers have created a circular ramp. In fact, they built two of them, one on top of the other, spiraling down to the valley below. This weird gigantic corkscrew looks so out-of-place set in the middle of the wilderness! The ramp is over a km long! When you're taking a corner on a motorcycle, typically, you're only ever leaning for the duration of the turn for no more than 180°, which is a hairpin. A popular activity for sportbikers in urban areas is "ramping", where you find a cloverleaf ramp on the highway system to get your lean on. But still, the turns are at most 270° before you need to straighten out and zoom over to the next ramp. 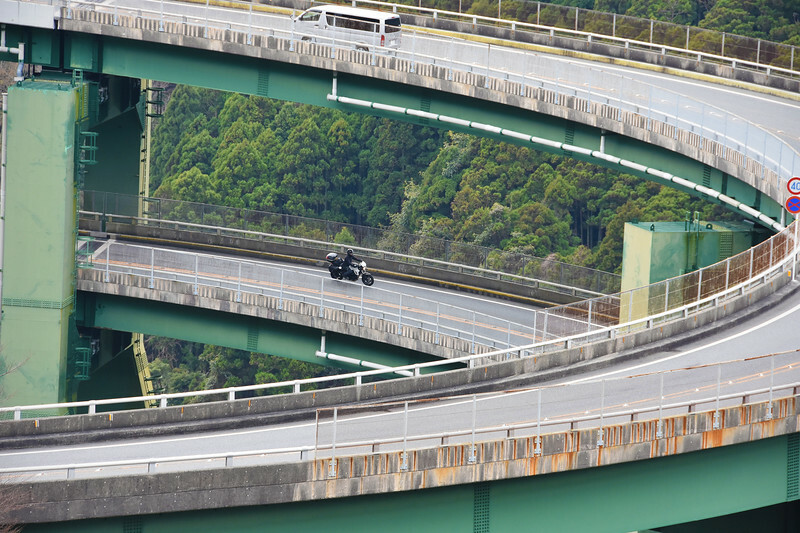 The Izu Loop Bridge is a 1080° turn - three full circles, ultimately spitting you out in the same direction you went in at! It feels so weird leaning a bike for over a kilometer! If there's no traffic in front of you and you keep a constant speed, you don't even need to provide any additional input at the handlebars to keep that lean angle going for what seems like an eternity! So cool! 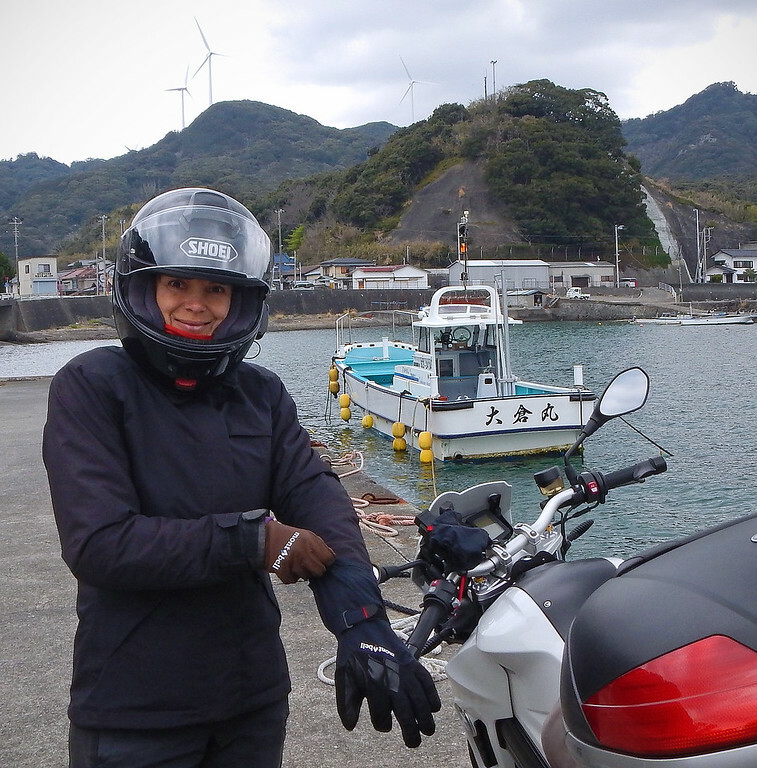 Stopping for a little break in the town of Minamiizu. Neda is saying, "I'm going to the washroom, you stay here and watch the bikes"
We're parked in front of the train station, and while I'm waiting, I see what looks to be a little fountain at the front of the entrance. But it's steaming! And there's a handrail and steps leading into it. If I didn't know better, I'd think this is a foot bath? Nobody else is using it, so I do a little what-the-heck shrug, slip off my boots and socks, plonk myself down and submerge my frozen feet into the hot water. AHHHHH! SO GOOOOOD!!!! 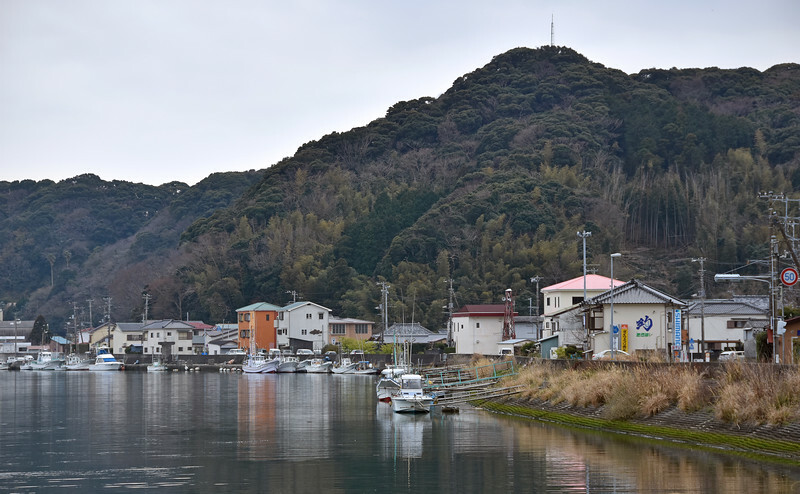 Japan has a lot of geothermal springs, and in fact the Izu Peninsula is a popular spot for Tokyoans to take a holiday and relax in the many hot spring resorts in the area. Resorts that are probably too expensive for us. This little tiny hot spring resort for my feet is totally free! slipped off her shoes and sat beside me and nodded approvingly! Hot Springs Footbath Confirmed! When Neda came out, she looked at us and laughed. "Looks like you made a friend!" she said. Haha! Maybe the old lady didn't know it was a foot bath either until I sat down in it! Neda takes the opportunity to make us a little brunch. Sandwiches on the road! A RideDOT.com staple! How many sandwiches have we eaten in the last half-decade? LOL! 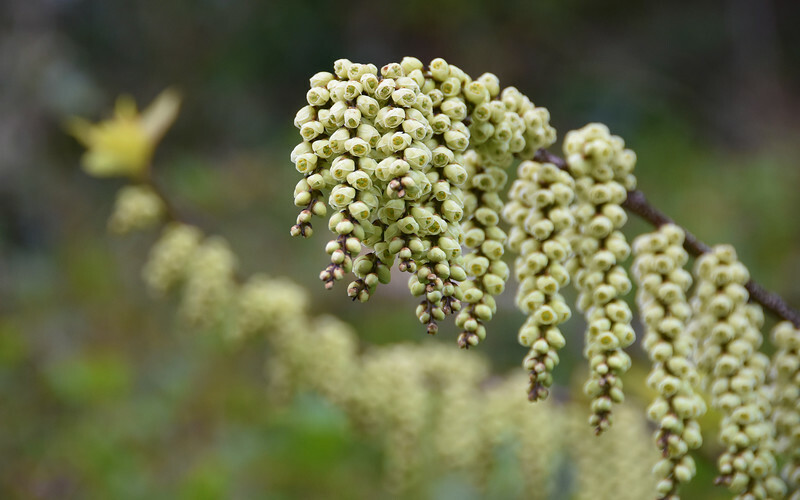 Surprisingly, Neda the botanist couldn't identify these flowers, so she went online to her Instagram community to find out. While other women follow fashion designers and celebrities on Instagram, she follows gardeners, hikers, dogs and cross-stitchers online... A Japanese gardener that she follows DMs her back: "Early Spiketail". Indigenous to Japan. Cool! We really miss our electric liners that we left in Croatia. You can see above the gloves we got from Montbell, that Japanese outdoor equipment store in Tokyo. It has a waterproof outer layer, which is great for blocking the wind. 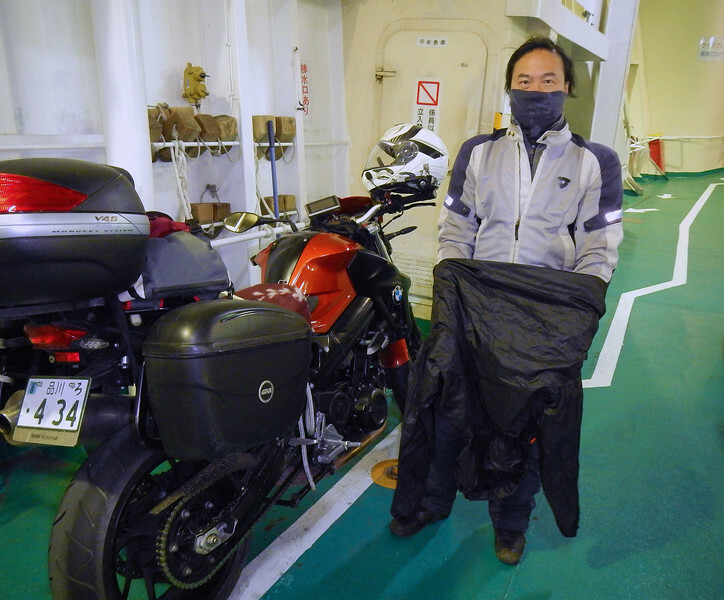 When we arrived, we decided against buying motorcycle-specific gloves and got some snowboarding gloves instead. That and our Uniqlo warm underwear makes the near freezing temperatures bearable while riding! 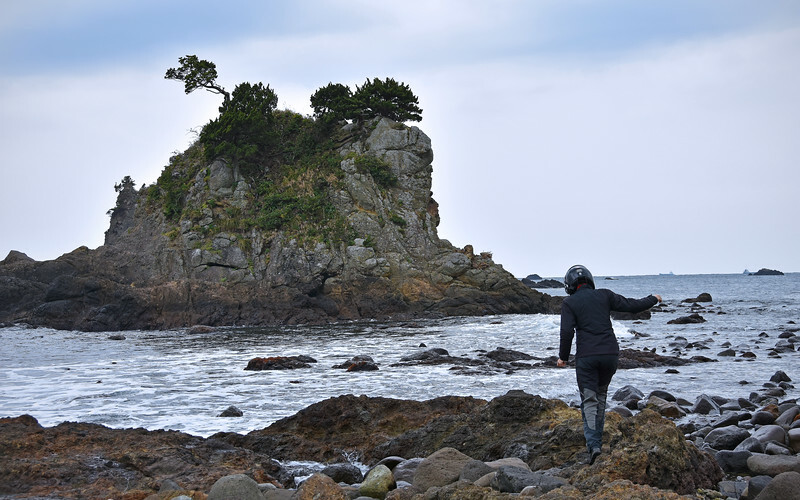 We're really impressed with the Japanese clothing and outdoor equipment gear. Good quality stuff and not that expensive either! Sadly for us, Road 136 - that scenic, winding coastal road we've been following all morning - ends at the town of Toi in the northern section of the peninsula. 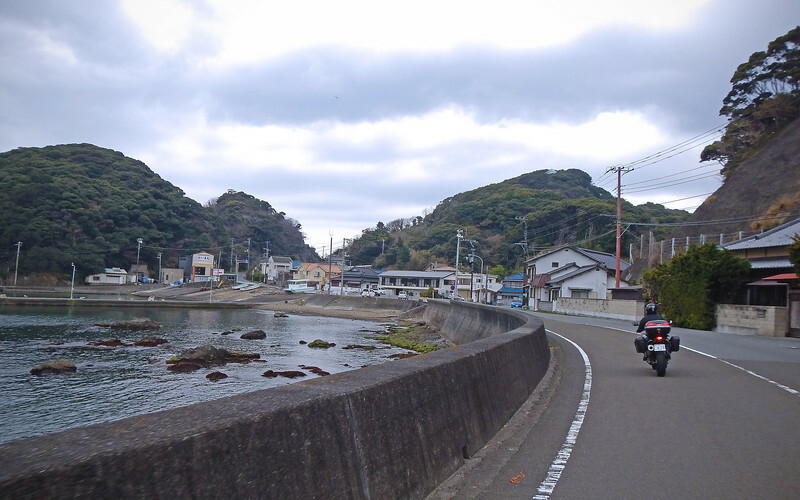 From here, it cuts back inland and curves around Suruga Bay. 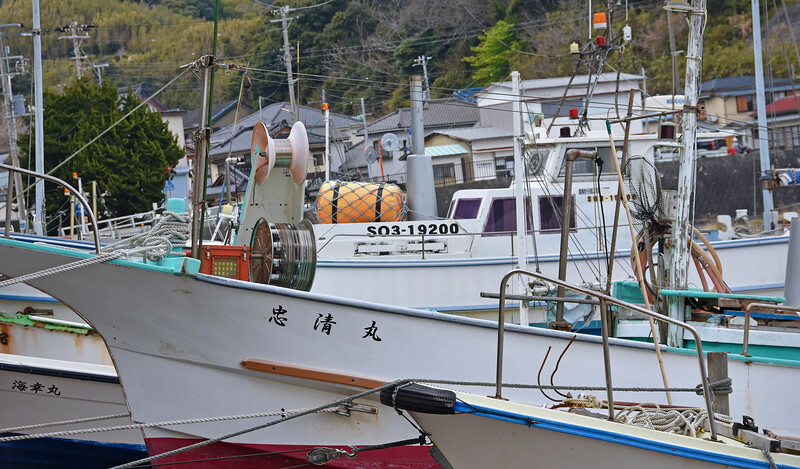 From looking the map, we see that the large urban metropolis of Fuji sprawls menacingly ahead of us on the northern shores of Suruga Bay. I remember what a slog it was getting out of Tokyo. A more palatable option is to catch a ferry across the bay, thus by-passing Fuji. From my rough calculations, taking the Tomei Expressway would probably be the exact same price as the cost of the ferry (¥2000 or $20 each). The ferry would be a heck of a lot faster as well. Plus we get to warm up inside the cabin! We've heard about tatami rooms in Japanese houses. There's also one aboard the ferry! Cool! Tatami mats are made of compressed rice straw and is a popular covering for floors in Japanese houses. I guess the Japanese people are so accustomed to resting on tatami mats that the ferry companies have to offer a special area for their passengers to lie on them during the crossing. The Sugura Bay ferry is only 70 minutes long, and this is our first time on a ferry in Japan, so we were too busy exploring the boat to test out these tatami mats. Next time! So early in the season! What were we thinking? Oh well, our quest for Cherry Blossoms in the south continues. 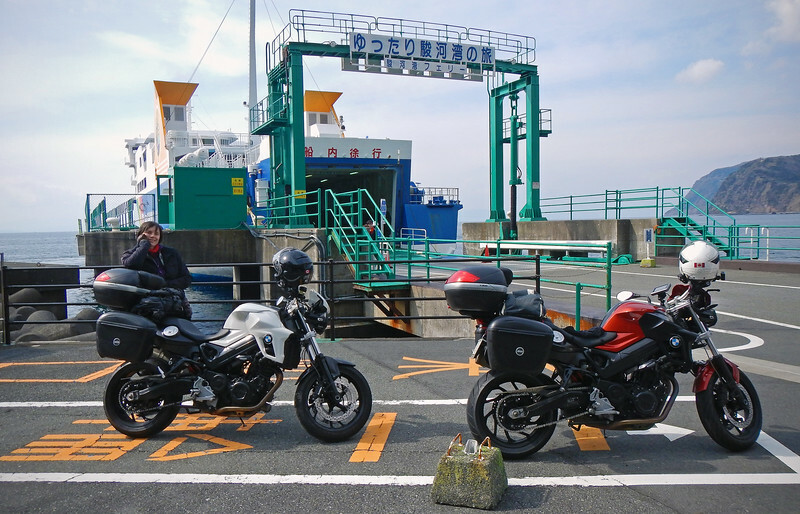 Riding off the ferry at Shimizu, we jump back on the super-expensive Tomei Expressway. 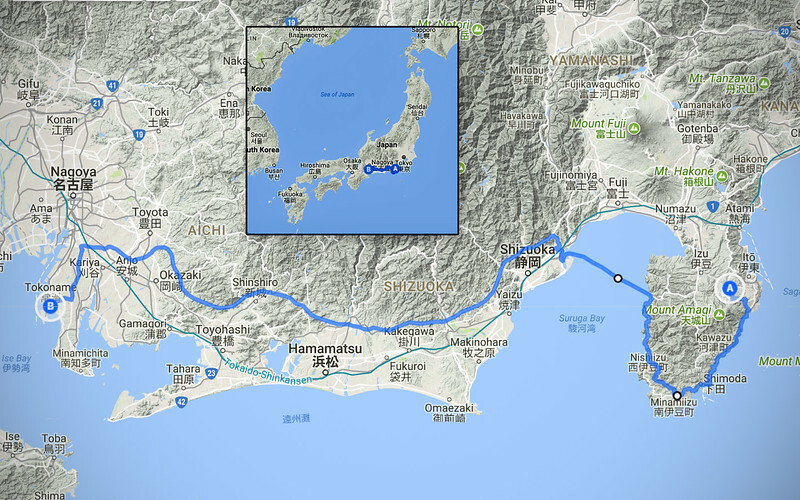 It struck me that we were paying more in tolls than accommodations in Japan... Crazy. I'm starting to understand why the Japan Rail system is so popular. It's really the cheapest *and* quickest option for traveling around the country. Driving your own vehicle is super expensive and time-consuming! 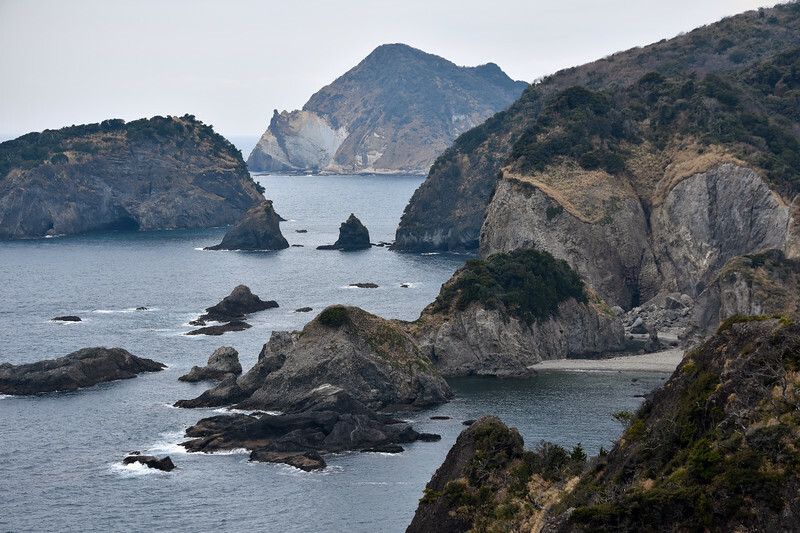 This section of Shizuoka prefecture is home to some mountainous regions in the north. 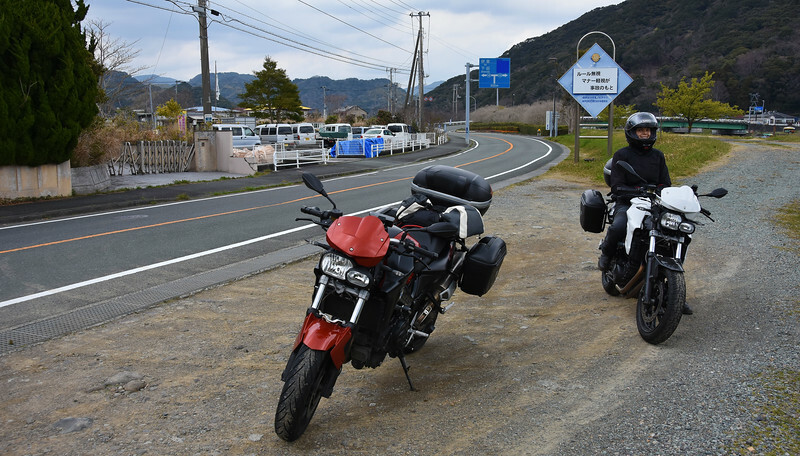 There is probably some really good riding up there, but due to our earlier experience outside of Mount Fuji, we suspect that those higher elevation roads will still be covered in snow. 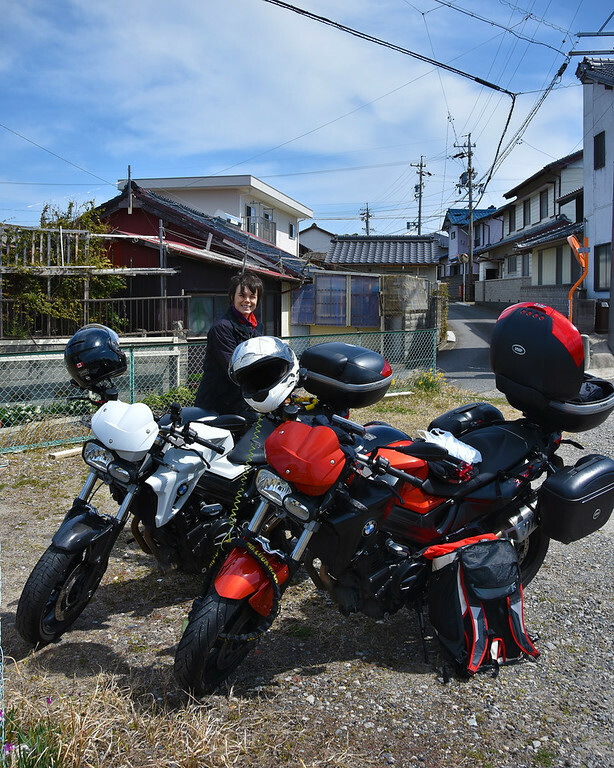 So we're toll-ing past them for now, but the idea is to hit those routes on our return trip back to Tokyo. Hopefully the weather and the surface conditions will be more motorcycle-friendly by then. AHHHH! Everything is automated and entirely in Japanese! This is what we get for stepping off the Gaijin Trail. There is no button for English. I don't know even know which button to press for assistance. I have to walk around to the back of the station to try to find a gas attendent. He seems surprised that someone is seeking him out. I'm probably the only person he's talked to today. And I don't even speak Japanese... Obviously he doesn't speak English. He looks at me strangely. I don't think I said it right. I nod my head vigorously, afraid to say anything else that will confuse him (and me) further. 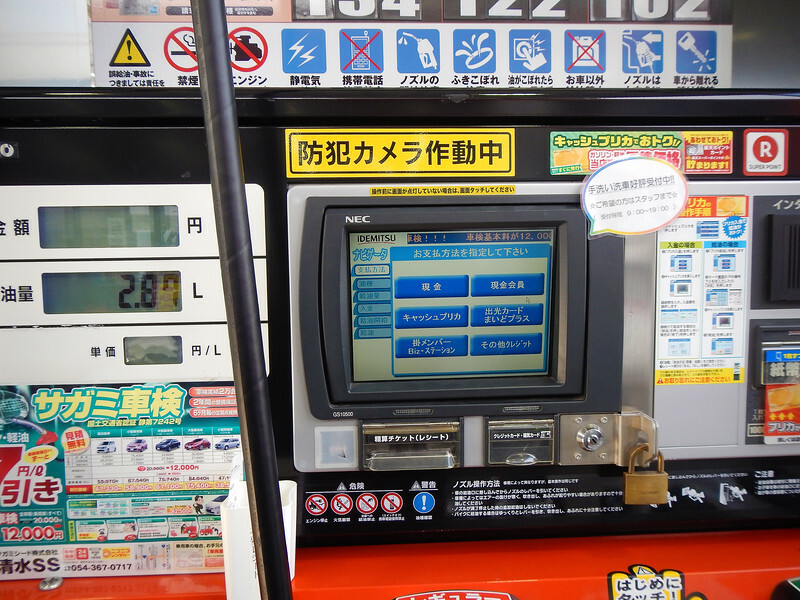 He fills up for us, then punches some buttons and shows me where to insert my credit card: "Kah-doh" Yes, I know that word! Phew! What an ordeal. I hadn't realized just how much we've gotten by during the last few years not knowing the different languages of the countries we ride through, simply because we are still able to pantomime or muddle through with our limited vocabulary. However, this is going to be much more difficult in Japan now that we're dealing with automated computer screens everywhere! Robots are taking over, and it's not a good thing! 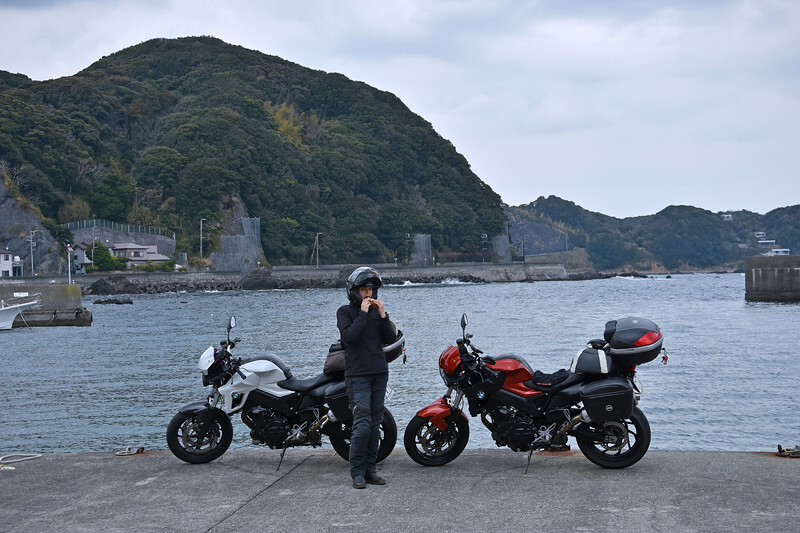 Back on the bikes with a full tank of haiku-ramen, we hop back onto the expressway and continue south-west. Prefectures fall fast behind us as we leave Shizuoka and enter Aichi Prefecture. 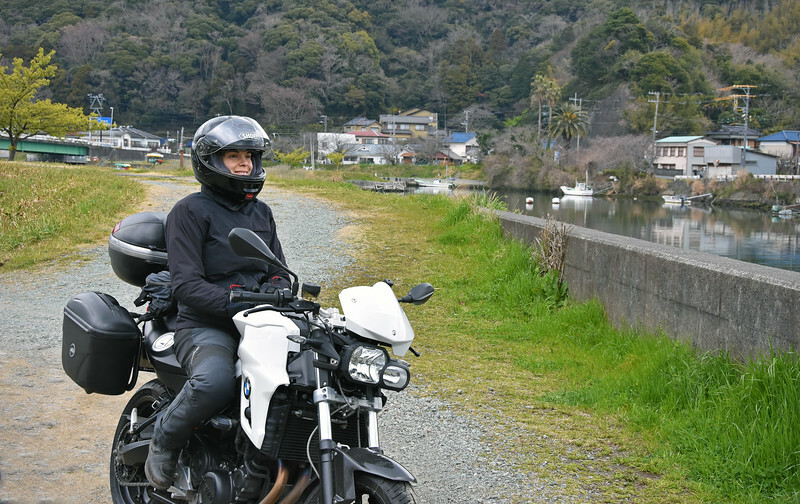 I see the sign for Hamamatsu flash by us and I'm glad that we're by-passing yet another large city on our quest for good motorcycling roads. Is it my imagination or is it getting sunnier?